"It's smart to be tough, but tough to be smart." 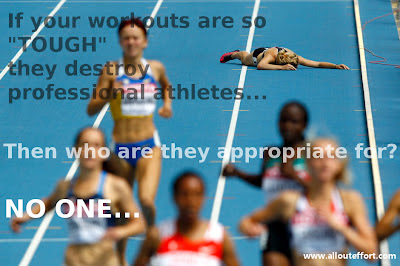 The old adage is especially true with fitness and exercise programming. Too often there is no actual programming or design, its basically stringing together a series of tough moves together with very little to no rest. From a corrective, functional, progressive, and just plain scientific standpoint about exercise. I don't know if anyone needs a sports programming background to do that. Some people mistake this for a good workout. Workouts aren't about making you feel like crap, workouts are supposed to improve your capacity in some way, not just pain capacity but athletic ability. There's a lot of high level athletes with low pain thresholds that prove athleticism isn't about how much pain you can take. And being elite is about being really good at something.